Beautifully engraved certificate from the Great Western Fire Extinguisher Company issued in 1869. 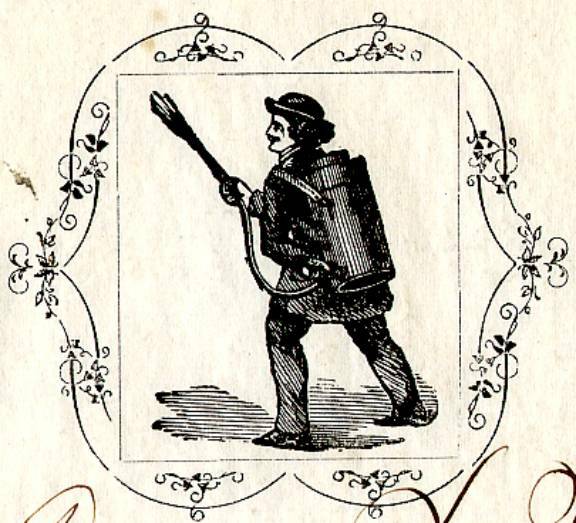 This historic document has a vignette of a fireman with an old fire extinguisher on his back. This item has the hand signed signatures of the Company’s President, and Secretary, and is over 147 years old. Fire Extinguisher.—Premium of diploma to the Great Western Fire Extinguisher Company. 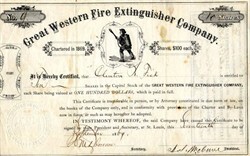 THE GREAT WESTERN FIRE EXTINGUISHER — BABCOCK's PATENT AND IMPROVEMENTS. This wonderful machine, which is rapidly going into very general use, is one of the greatest chemical successes of the present age. Its great control over fire is purely scientific, and must be seen to be realized. Hydrogen produces flame in union with oxygen, and oxygen gas cannot live in the presence of carbonic acid gas. This machine generates carbonic acid gas, with which the water in tko machine is thoroughly impregnated, and by the pressure created in the machine by the gas, the water is ejected fifty feet in the shape of a spray upon the fire. The moment the spray comes in contact witi the flame, the heat liberates the carbonic acid gas from the water, and expanding to a great extent, soaks down through the flame, and by destroying the oxygen gas, the supporter of combustion, immediately extinguishes the fire—and in less time than seventy-five times the amount of water, without the presence of carbonic acid gas, could do. Its influence over fire is consequently magical, and cannot fail to be successful in every case where the fire is not too large to be approached within thirty or forty feet. The charging of the machine is perfectly simple; it is kept constantly filled two-thirds lull with water and half a pound of bi-carbonate of soda dissolved therein, and when wanted to use on a fire, the only thing to be done is to light a fuse and drop it into the top of the machine and screw down the top, so that in less than one minute the Extinguisher can be brought into action, and is then of more service in extinguishing fire than twenty men with pails of water. It has perfect control over coal oil, tar, turpentine, varnish, or any chemical substance, and will extinguish them as rapidly as ordinary combustible material. The exhibition given of the machine on the Fair Grounds, during the late Fair, fully demonstrated its value and elicited unbounded applause. The Great Western Fire Extinguisher Company is located at No. 525 Washington avenue, St. Louis.